Sound Percussion focuses on many of the most common accessory percussion instruments and uses them as integral parts of the ensemble. While sometimes they perform as a supportive role, there are many times accessory percussion instruments take center stage. Specific techniques, rhythmically exciting parts, and full integration make this book one your students will want to play. Accessory instruments in the book include crash cymbals, suspended cymbal, triangle, tambourine, woodblock, bongos, concert toms, claves, cowbell, castanets, and more. 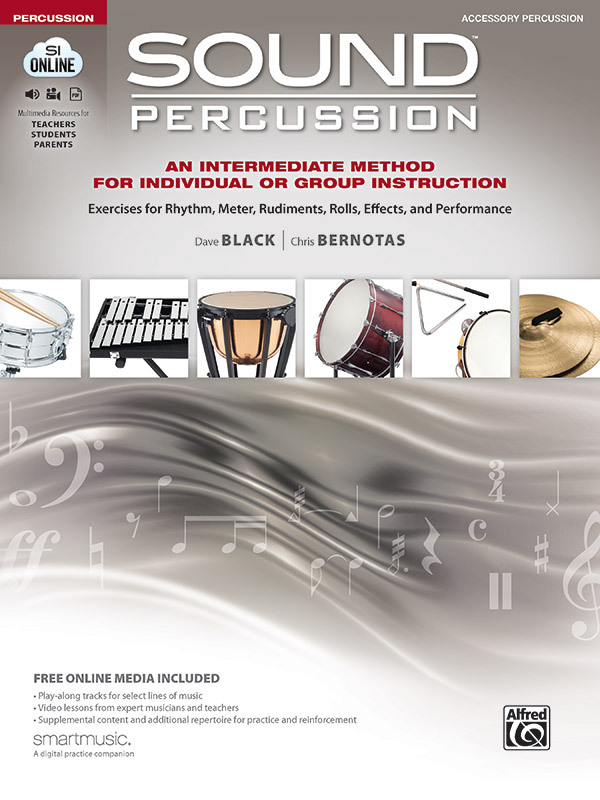 The Your Instrument section explains each of the instruments’ parts, setup, care and maintenance, playing position, stick selection, dampening, and more. While the most common accessory percussion instruments are described in the front of the book, many additional accessory instruments are introduced toward the back of the book including maracas, guiro, sleigh bells, slapstick, gong/tam-tam, hi-hat, cabasa, wind chimes/Mark tree, and temple blocks. While those playing snare drum focus on the more advanced rudiments in the Sound Rudiment section, accessory instrument players will learn how to apply and experiment with sticking patterns while playing supporting parts. Their focus is to find patterns that allow for the most musical and comfortable performance of their parts while supporting the rudimental study. Rolls are explained in the Sound Rolls section in detail for each of the applicable accessory instruments, including video MasterClasses to aid in student comprehension. Students are introduced to sound effects for many of the accessory instruments, such as cymbal scrapes, water-gong effect, rim shots, two-plate cymbal roll, and more.